LordSputnik: wait aren't you a student? He's a real boy now, reo. Are you available for the release this morning? we can release at 14:10 UTC? zas: can you mark it for 1.4.1? we can build it then? Will you merge Qt5 stuff today? Don't forget to create a 1.4.2 branch so we can spin off minor maintenance releases. Since we will need to redo the dev environment, it might make sense to merge the Qt5 and Py3 changes at the same time so that I only need to redo it once. Good morning from my BTW. Sorry - what I said was confusing - I mean our personal dev environments on our PCs. No need to make a 1.4.2 branch before it's needed though. However I think they have to be opened again against 1.4.2 instead of master? samj1912: You can just cherry-pick or merge. Esp. if you merge those after 1.4.1 release but before 2.0 breaking PRs. Well, you can always merge the PRs manually instead of doing it through the GH interface. Then you are in completely control over which branches they get applied to. Also, if the code will get rewritten, it likely won't do any harm to have the PRs merged into the branch anyway. Some people (e.g., me :)) are using Picard from latest/recent git/master, so until the 2.0 changes are actually done, the 1.4.2 ones might be nice to have. If we are happy to have 1.4.2 using Qt5, then we don't need a 1.4.2 branch yet. But if we want to stick with At4 for the 1.4.x releases we need to split off the maintenance branch before merging Qt5. Freso: That is why I was asking about Qt5 in the 1.4.2 - people running from source will need to install Qt5. Sophist: If they run raw, ie. straight from git, they will have to keep up with git and they should know as much. If they run from some package, say AUR's picard-git, then the packaging should handle that for them. zas: I think that is best too. In which case we need to split off the 1.4.x branch before merging Qt5. The 1.4.2 branch can be split off three years from now from a commit five years ago, if we wanted to. Oh. Perhaps I don;t understand Git that well then. metabrainz/picard#2243 (master - 1e94ac7 : Laurent Monin): The build passed. can you build the latest osx versions? metabrainz/picard#2244 (master - 1aa4568 : Laurent Monin): The build passed. 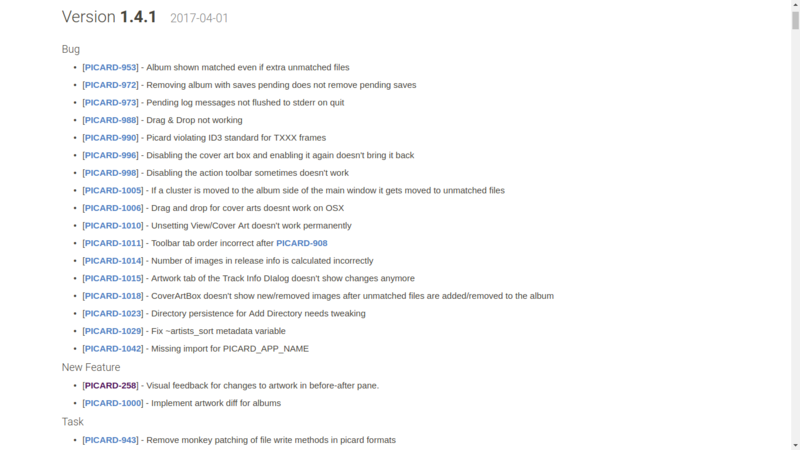 metabrainz/picard#2245 (release-1.4.1 - 1aa4568 : Laurent Monin): The build passed. metabrainz/picard#2246 (1.4.x - 1a8d9b4 : Laurent Monin): The build passed.